Shipping, tracking, and calculating time and cost of shipments are at the heart of ecommerce businesses. Merchants are usually tied to a desktop to make all these choices for shipping their inventory. But there are several mobile apps that can now help free merchants from their desks. I looked at the top 40 shipping-related apps — based on user ratings and the most downloads — for each of the top three mobile platforms: iPhone, Android and BlackBerry. I then handpicked, from that group of 40, the top five most popular shipping-related apps for each phone. Download these apps and track all of your shipments from your mobile device while on the go. Avery Universal Package Tracker on Android. 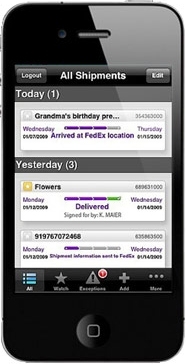 FedEx Mobile. Get up-to-the-second tracking information for any FedEx-shipped package by simply keying-in the tracking number. Generate shipping labels on the fly; create custom package-delivery-monitoring lists; get shipping rates; and access FedEx’s web portal. Shipments sent or tracked using FedEx’s Ship Manager, FedEx Desktop or anything added to My FedEx can be viewed and managed from your phone. Price: Free. iPhone App, Android App, BlackBerry App. UPS Mobile. Manage all your UPS shipments, track all packages en route, create shipping labels, and estimate shipping costs and delivery times anywhere there is a cellular signal. 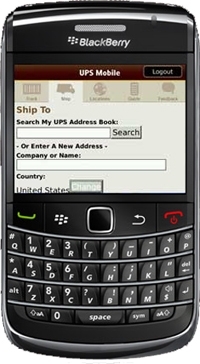 You can also quickly find the nearest UPS service store if you need to drop a shipment off by hand. Price: Free. iPhone App, Android App, BlackBerry App. Avery Universal Package Tracker. Track shipments with most of the major shipping carriers on this single app, which is compatible with FedEx, USPS, UPS and DHL. You can get detailed carrier progress scans, estimated delivery dates and find the current location of your package on a Google map. Track up to 50 packages from multiple carriers at a time or just key in the tracking number to get on-the-spot package info for a single item without having to log in. Price: Free. iPhone App, Android App, Not available on BlackBerry. USPS Mobile. Track packages, calculate shipping prices with a handy postage calculator, look up zip codes, and determine pricing and timing for any type of shipment. You can also check the status of packages sent with any other type of shipping service, including FedEx, UPS and DHL only. You can also find USPS locations and USPS drop boxes within walking or driving distance. Price: Free. Track Packages. 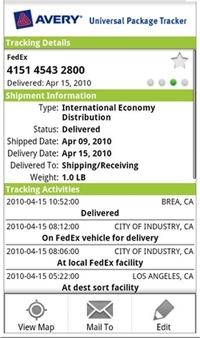 This third-party app will help you track any shipment sent via UPS, USPS, FedEx and DHL. It knows the difference between ground, overnight and Priority, Registered and Certified Mail. It will give you instant status updates, the URL to the carrier’s package detail page, and send you notifications when the package arrives at its destination. Handy barcode scanner tool included so you can simply scan a package to enter it into your tracking queue. Price: $.99. Overnight. This is a comprehensive suite of tools to (a) track packages from DHL, FedEx, UPS and USPS (b) get price quotes for all domestic packages across all carriers, (c) find carrier drop-off and service locations, (d) locate zip codes and determine map-plotted progress on every package shipped. Price: $4.99. Delivery Status Touch. Track packages all around the world. Supports 25 major domestic and international shipping carriers, including UPS, FedEx, USPS, DHL, TNT, Canada Post, City Link, and DPD. If you are using a shipping service that isn’t supported, simply key in the delivery date and service URL and Delivery Status will track the site for you. Price: $4.99. Package Tracker Pro. Track packages from 25 major domestic and international shipping services, including UPS, DHL Global — in both U.K. and U.S. — and FedEx, USPS, Royal Mail, Spanish Post, Swiss Post and many more. Get alerts when your package is delivered; if there is a problem and see a live map of where your package is instantly. Price: $1.99. Mobile Package Tracker. Track over 18 shipping carriers in one app, including FedEx, USPS, UPS, DHL Global — in both U.K. and U.S. — and TNT, Canada Post, Royal Mail and more. Label packages, get alerts upon delivery or delay. Price: $3.99.